The USS Texas is now a shrine moored at the site of the San Jacinto battlefield about 20 miles east of Houston. Perhaps better known as the Battleship Texas, she remains as an icon of a noble past. Although thousands of sightseers visit the memorial each year, few realize that her heritage extends back more than 100 years. In fact, two American battleships have been christened the USS Texas. And both have served admirably in major campaigns of the U. S. Navy. The first Battleship Texas was christened on August 15, 1895, becoming the first American steel-hulled battleship. The 309-foot vessel was soon called into action. It was used to bring home the bodies of those that died in the sinking of the USS Maine in Havana harbor on February 15, 1898. In the Spanish-American War that followed, the Texas participated in the defeat of a Spanish squadron during the Battle of Santiago, fought July 3, 1898. USS Texas (I). The first USS Texas was also the first American steel-hulled battleship. It was commissioned in 1895 and fought in the Battle of Santiago during the Spanish-American War. 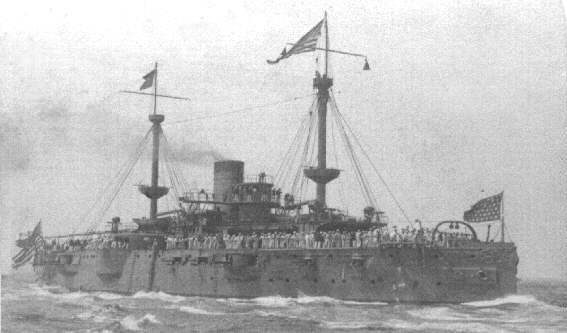 It is shown here returning from that engagement in 1898. After the war, the Texas served in various peacetime activities until 1911. At that time, its name was changed to the USS San Marcos so that the name Texas could be reassigned to a new, more modern battleship. After being brought in and out of service for several years, Texas I became a gunnery target for newer ships in the U. S. Navy. She now lies at the bottom of the Chesapeake Bay, about seven miles southeast of Tangier Island. The keel of the second battleship to be named the USS Texas was laid at the Newport News, Virginia shipyard in 1911, the same year that Texas (I) was decommissioned. This new 573-foot vessel (sometimes referenced by its hull number--BB35) was launched in May 1912 and christened in March 1914. It displaced 27,000 tons and was powered by dual steam engines, together capable of delivering over 28,000 horsepower. It served in the Atlantic Fleet during World War I and was present at the surrender of the Imperial German Fleet in 1918. USS Texas (II). The second Battleship Texas was christened in 1914. 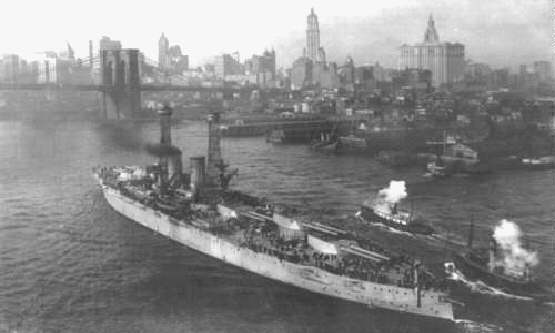 Among its first stops was New York harbor, as shown above with the Brooklyn Bridge in the background. In 1925, the USS Texas underwent extensive renovation. The coal-burning boilers were replaced with oil-fired units. In addition, a new superstructure was installed and significant changes were made to the forward main deck. With these changes, she became a key component of the United States Fleet. On June 6, 1944 (D-Day), the Texas served as the flagship for the bombardment group supporting the landing of Allied troops on Omaha Beach. Later that same month, she survived two direct hits from German shore guns. After the damage was repaired, the USS Texas was moved in 1945 into the Pacific theater, where she supported the landings at Iwo Jima and Okinawa. Landmark. After serving in both World Wars, the USS Texas (II) is now moored at the San Jacinto battlefield near Houston. Note: the superstructure was remodeled in 1925. Soon after World War II, ownership of the Texas was transferred to the state of its namesake to be used as a state historic landmark. The battleship is now permanently moored near the San Jacinto monument--the site just east of Houston where Texas won her independence from Mexico in 1836. The battleship is maintained by the Texas Department of Parks and Wildlife.